Halloween can be a lot of fun for kids of all ages, but it's important to remind children of important safety rules for this holiday. Printable handouts are an excellent way to drive home the importance of being safe while also having fun. Choose a printable handout that is appropriate for your child's age. If you need help downloading either of the below Halloween safety printables, check out these helpful tips. Download a Halloween safety coloring sheet. Select this printable for younger children. 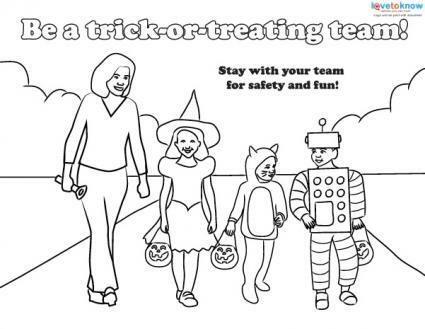 This simple coloring sheet reminds kids about the importance of staying in a group while out trick-or-treating. The group is led by an adult. The adult carries a flashlight. The children's faces (and vision) are not obscured by bulky masks. The costumes don't drag on the ground. Download a Halloween safety checklist. 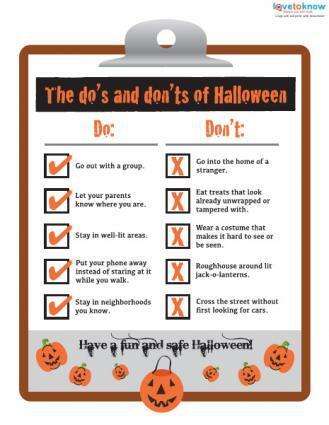 This handout is appropriate for older kids and provides a simple checklist of safety do's and don'ts for Halloween. Hand this printable out to kids and consider further expanding upon the simple concepts presented within the lists. For example, explain why it's important to stay out of strangers' homes or why kids should go out in groups. Plenty of other printable handouts are available online for a wide variety of ages. Find the printable that works best for the Halloween safety tips you want to teach. McGruff's Halloween Safety Maze: Help McGruff the Crime Dog navigate a maze while also learning important safety rules for Halloween. Scholoastic Halloween Safety Tips: This printable offers a simple list of safety tips. This can also be used as a coloring page. 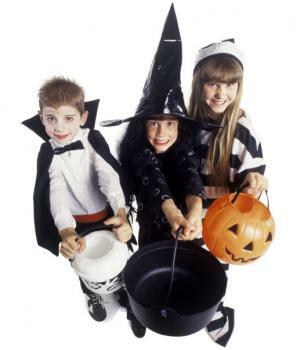 Cardstore Safety Tips: This list of Halloween tips is geared toward parents, reminding them of things they should do before allowing kids to go trick-or-treating. NIE Rocks Word Search: This is a crossword puzzle featuring words that can prompt discussion of Halloween safety. Deadly Cute: This printable handout from the U.S. Consumer Product Safety Commission reminds kids to select costumes that are easy to wear, see out of, and breath through. Prepare your kids to have plenty of fun on Halloween by making sure they know the important safety rules that should be followed. Kids will have more fun when there are no avoidable mishaps involved.